Here we take a look at the important area of behavioural and cultural change training, and some of the best elearning providers who can help you to make it easy, accessible and effective. The online learning market has traditionally been heavy on compliance and training that’s related to an urgent need – onboarding staff, getting up to speed with new legislation etc. For this reason, elearning is still seen by many business leaders as being reserved for dry topics and box-ticking exercises. However, there a few innovative companies making great strides in combining the latest web technologies with learning and engagement psychology to create some truly engaging elearning for every area of business – including the complex field of behavioural and cultural change management. While there is a great deal of off-the-shelf content out there for certain soft skills, such as sales techniques and customer service principles, large organisations looking to gain a competitive edge through behavioural and cultural change tend to use in-house trainers that focus on face to face sessions. This can be highly effective, but the process is far from convenient, with staff often feeling that they are being dragged away from the office, often for a day or at least a half-day, with no immediate tangible benefit. The novelty of time away from the usual working environment, the distraction of peers, and concern over the build-up of workload whilst away can often get in the way of the messages you’re trying to get across. So there has perhaps been a void in terms of the huge business impact that comes from the more subtle, but really important, behaviour and cultural change management training and the convenience, repeatability and accessibility benefits of elearning. As there is now some excellent elearning in the marketplace for these higher level areas of business and management, here we profile 3 of the very best providers. True specialists in this area, we have become more aware of The Engagement Coach over the last year or so, and are really impressed with their ethos, approach and delivery. Their work draws on the latest psychology and neuroscience to help unlock the passion that can drive optimal staff performance. They help business leaders to find real employee engagement through behavioural and cultural change management. Every company with multiple employees and a management structure will conduct staff surveys, 360 degree reviews and more, ending up with a pool of data to try and sift through and interpret. Gaining real insights from that data is not always straightforward or reliable though. This lack of insights can lead to some business leaders neglecting investment in training related to behaviour and company culture for fear of not being able to pinpoint the issues, and therefore create programmes to bring measurable results. With their experience in employee engagement and their ability to pull insights from data, The Engagement Coach support organisations by identifying the key areas of focus needed to drive real behavioural change. They use these insights combined with their expertise in human behaviour to develop training, with 3 steps that anchor everything that they do – Understand, Identify & Act. Act: creating a strategy and programme of training that caters for the needs of different groups across a company. The result of this approach is tangible business benefits. 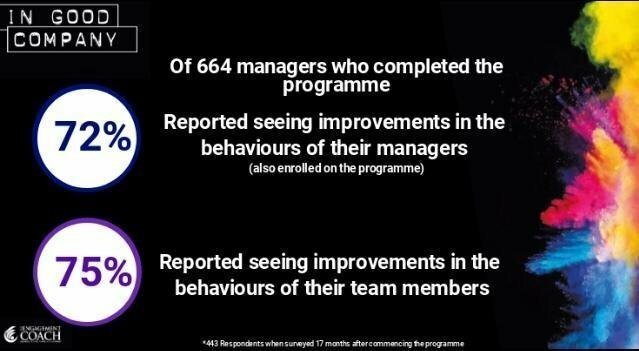 In our review of their leadership development training programme, we learned that 75% (443 respondents) of managers who had attended the programme, reported seeing a positive improvement in the behaviours of their teams, 17 months after commencing the programme. That’s extremely impressive for training in this area. A combination of a clever storyline (written by a BAFTA nominated screenwriter), science, structure and convenience is what makes this training unique. Delivered over 12 months, In Good Company involves a Netflix-style mini TV series, where you get to know and understand characters that we can all relate to from a business environment. The Engagement Coach core team brings together huge amounts of expertise and experience, including Employee Engagement, Leadership Development and Psychology, working for some of the world’s best known brands. Founder and CEO Amrit Sandhar qualified as a pharmacist before holding a senior operational roles at Boots and Asda, and later heading up Employee Engagement at Asda. This led to a role with Best Companies (the organisation responsible for The Sunday Times Best Companies list), helping clients with their employee engagement strategy and gaining further insight into how the vast majority of companies fail to unlock the passion and true potential of their employees. The Engagement Coach was born from Amrit’s own passion for helping companies to do better and this was evident when we talked to him. His expertise is in demand and he has been a popular speaker and interviewee on the subject of Employee Engagement. The Engagement Coach is without doubt a top UK provider of behavioural and cultural change training that helps companies to get the very best from their people. This is delivered with the convenience and efficiency of elearning and blended learning. The team has helped numerous well-known organisations, including TrustFord, Bupa, Asda, Dunelm, Elevate Credit and the Royal College of Nursing to name just a handful. Highly recommended. Visit https://www.theengagementcoach.co.uk/ to learn more. With the most vibrant colour scheme in the market and their informal, superhero-led communication style, Growth Engineering certainly take any stuffiness out of elearning. Everything they do clearly has engagement as a core facet, and this company understands that to really influence behaviour change, even for dry subjects, gaining the interest of your learners is essential. Growth Engineering are leading proponents of the latest elearning developments and technologies, especially Gamification, Social Learning and the use of Mobile Learning Apps. They draw on the principles of personalised learning and game development to draw in learners, but place a great deal of emphasis and importance on behaviour change across trainers and managers, as well as front line staff. Learn more about the Growth Engineering approach to behaviour change on their website. This video-based elearning company specialise in online courses in popular soft skills areas, such as Leadership and Management, Customer Service, Influence and Negotiation, Sales and Compliance. Video Arts clearly understand that a key barrier to impactful behavioural and cultural change is gaining the interest and attention of your learners. Video-based elearning is a great start and is way ahead of text and static images as a medium. However, Video Arts take this a step (or perhaps a huge leap) further though and are unique in their extensive use of celebrity actors for their cast. You can’t help but pay greater attention when your training content is being delivered by some of the top TV personalities from UK drama, family entertainment, and particularly – comedy. A novel approach to elearning that helps overcome the biggest barrier to training for behaviour and culture change – getting your learners interested enough to start the course of their own free will. Once through the door, the engagement and entertainment makes learning and behaviour change a natural consequence of that attention. Browse their video based elearning catalogue over on the Video Arts website.